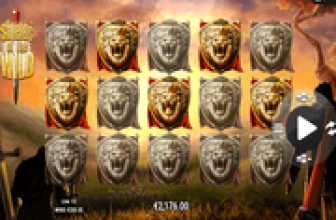 Druidess Gold Online Slot : Mega Win Your Way to the “Ring of Protection” Mega Spin! Druidess Gold online slot is another Lightning Box/NextGen Gaming content configured with a Reelfecta Reel. The special reel contains 16 images, all available to use in completing winning combinations. Every pay way is a free flowing pattern that merely requires 3 or more consecutively appearing images starting from the leftmost reel. That way, two or more identical symbols lining in up in Reels 1 and 2 can easily find a match in Reel 3, as this column poses as the Reelfecta Reel. Any other similar icon falling in Reels 4 or 5, extends the arrangement into a longer 4- or 5-symbol combination. The Reelfecta Reel is also a significant Bonus Game attribute. The Wild and the elements of the free-spins round are positioned exclusively in this column. Once Druidess Gold players enter the bonus game, they will be spinning their way through a Wild enhanced Reelfecta Reel that has potential to culminate to a wild-filled Mega Spin. The image of the featured Druidess represents the Wild Symbol. It comes into view only in any of the 16 positions held by Reel 3, and in Reel 4. Consecutively appearing identical symbols in Reels 1 and 2 can easily find not only a likely match, but also a substituting Wild in any Reelfecta position. If a Wild is also in place in Reel 4, the better the outcome, as a matched-grouping will expand into a longer winning combo. In the free round, a Druidess Wild is sure to take position in the Reelfecta Reel. This particular Wild locks in place and triggers a free spin. As more Locked Wilds occur after every subsequent bonus spin, the likelier the chances of extending the bonus round up to the Mega Spin event. A Green Rune represents the Bonus Game Symbol. It is configured to appear only in the Reel 3 Reelfecta area and only in the outlying positions of the 4×4 block. When five or more Rune Bonus Symbols emerge as Reelfecta elements, the “Ring of Protection Bonus Game” commences. Moreover, a grouping of 5, 6, 7, 8, or more Rune Symbols trigger the release of 1, 5, 10, or 25 coin credits respectively. Scatter Rewards though are awarded only on the highest number of Rune icons in view. Since the Reelfecta block has 16 positions in all, nine (9) or more triggering the round award 500 coin credits. The number of spins awarded by this symbol is not fixed; but up to twelve may be activated. Every Druidess Wild appearing in this segment stays locked in and triggers a free-spin. At the onset of the free round, a Druidess Wild is already in place in the topmost position of Reel 1. In the next three (3) spins and following a clockwise direction, additional Druidess Wilds are guaranteed to appear in adjacent positions. By the fourth bonus spin, four (4) Druidess Wilds are locked in place, all available as compatible matches to identical symbols consecutively positioned in Reels 1 and 2. However, starting with the 4th free spin, a Poison instead of a Druidess Wild may emerge. Such an occurrence immediately ends the “Ring of Protection” Bonus Game. Yet in the event that all 12 outlying position of the Reelfecta Block is filled with Druidess Wilds, the free games will culminate with a Mega Spin. The Mega Spin bonus game feature is the most potent of all Reelfecta outcomes. Here, the remaining six (6) positions at the center of the 4×4-block reel, transform into a huge 2×3 image of the Druidess Wild, whilst framed by the 12 regular-size Wilds. Druidess Gold : Terrific Bonus Game Locked Wilds that Further Chances of Landing a Mega Spin Win! 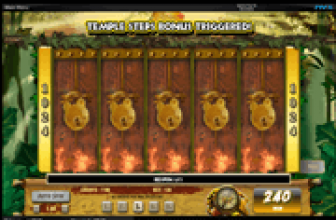 Druidess Gold by Lightning Box, is a 1029 ways to win slot enhanced with a Reelfects Reel that offers up to 16 potential matches to consecutive identical images occurring in Reels 1 and 2. The Wild and the Bonus Game Symbols are strategically and exclusively positioned in the Reelfecta Reel as multiple displays of those special icons will prove to be highly beneficial to slot players.